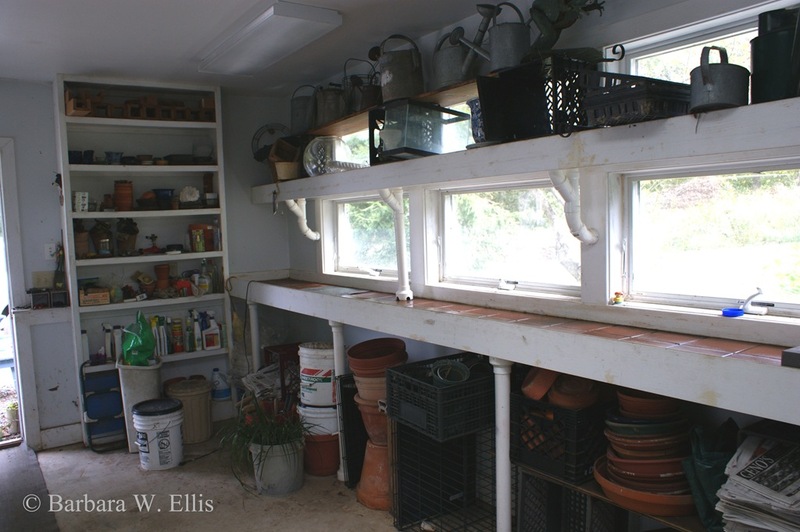 Today, I would like to testify that my greenhouse/potting shed has been clean for 24 hours. I have recorded that stunning fact in two pictures, one from each end. Since this is the epicenter of my garden, home to everything from tools to all things green, it only happens a couple of times a year. Alas the cleanliness can’t last. In the off season, I use the greenhouse to overwinter tender perennials in pots and as cuttings. It’s also the winter home of houseplants that either don’t fit into the house anymore or need cooler conditions than our house offers. (Clivias are an example: To bloom well, they need a cool, dry dormancy. I can do dry indoors, but 40°F is another story.) Add to that starting seeds, nursing on divisions, holding plants for plant sales, and you have the general picture. The pressure to move plants back indoors begins building with the onset of cool weather. The first order of business is cleaning up the mess left from spring and early summer activities. There are countless pots and flats to put away. 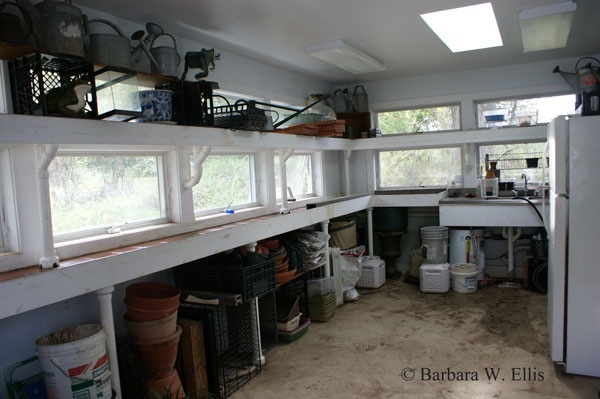 I am also always trying to figure out the perfect way to store everything from potting soil and rooting medium, to bushel baskets and tarps. After that, taking cuttings of tender perennials like coleus is next on my list. While coleus and other tenders will survive right up to the first frost, the more cold weather they are exposed to, the harder they are to root. I’ll get them in this week while they are still growing strongly, although earlier probably would have been better. After that, I’ll gradually move in pots of other plants that warrant holding until spring—plus the aforementioned houseplants. I’m also planning to dig a few things, including cannas and a dahlia or two, for overwintering. My goal is to avoid moving everything in a mad rush the evening when the first hard frost is predicted. I have personal experience with dawdling, and the end result isn’t pretty. The year everything ended up stacked in the living room comes to mind, and I’d rather avoid making that particular mistake again. Still, no matter how careful I am, this is inherently a messy process. By the time I’m done there’s little doubt the greenhouse will be the polar opposite of neat and clean. All the more reason the commemorate its current condition here. Despite the impending mess—and I promise to post a picture of it once everything has been moved inside—I love working out in the greenhouse when plants are packed in cheek by jowl. All winter long it is a reminder of a new season to come—plus the place where many of my new garden residents get their start. Still, a little neatness would be nice. Upcoming Workshop. I wanted to invite anyone who is interested in learning more about rooting cuttings and other types of plant propagation to sign up for my upcoming workshop at Adkins Arboretum, Adventures in Plant Propagation Workshop, Wednesday, October 5; 10:00 a.m. to 12:00 noon. (Cost: $15 members; $20 nonmembers.) Hope to see some of you there!